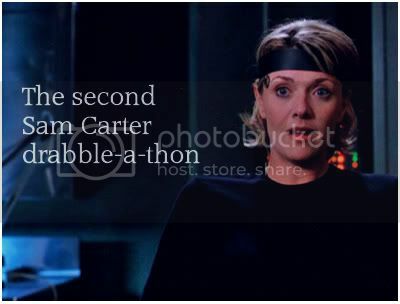 The Second Sam Carter Drabble-A-Thon is open for business until the Saturday 21st March. Read the rules, choose a prompt, write a drabble. It's pretty much that simple. It's almost time for the 2008 Isis Awards! For those who may not have heard of these awards, they were originally created to celebrate the less prolific het pairings in Stargate fanfiction. We wanted every author to be given a chance to shine, whether their chosen pairing was popular or not, and considering the success of these awards over the past few years, we feel that we've accomplished that goal. Now it's time to do it all again! Nominations open on October 4, so it's time to start tracking down all the great fics you've read over the past few months. We're very excited to get things started, and we hope you'll feel the same! Someone has made a few Barrett and S/B icons. They are pretty, so I thought I'd pass along the link. Summary: The right time finally arrives. A/N: For mysticalweather who wants Sam/Barrett desperately. Or, if you prefer, you can click here to view it on YouTube. Summery: Getting handcuffed to metal railings in empty warehouses happens to a lot of guys? Notes: A little ficlet written for the sg_rarepairings fic battle. Hello like-minded shippers! I've been lurking here for a while, but tonight I was extremely bored and unusually creative so I made 14 Barrett and Sam/Barrett icons. Feel free to use them, just please comment&credit. Summary: They're already too close, pressed against the side of the building, and his touch makes her jump. WARNING: HUGE spoilers for Atlantis Season 5 casting. Summary: How Sam *finally* gets a clue. Found a S/B fic while perusing LJ. Thought I'd post a link to it here. Spoilers: Anything with Barrett in. So, in an attempt to wake my lazy muse, I decided to try something new. So here's my first attempt ever at writing a drabble. It was kind of a fun challenge for me. Exactly 100 words can be hard to do! So, anyway...here it is! Hope you enjoy. Feedback is appreciated and loved. This is my first attempt at a Sam/Barrett and it's really Sam/Jack....you'll see if you read it. Feedback is much appreciated as I don't have a Beta. Summary: As doctors attempt to break Ba'al's brainwashing of Agent Barrett, Sam suffers the pain that time can bring. Author's Note: Okay, mysticalweather. This isn't exactly what I had in mind for you, but I hope it will do until I have time to write something a bit longer. This is my way of bribing you to continue to be patient. Hope it works. Disclaimer: Stargate, Stargate SG-1 and all of its characters, titles, names, and back-story are the property of MGM/UA, Double Secret Productions, Gekko Productions, SciFi Channel, and Showtime/Viacom and so on and so forth. No profit being made; just having fun. theemdash is making a "Thank You for 10 Years!" banner (banner can be viewed here) that's to be signed at Dragoncon next week and then presented to Christopher Judge to bring back to Vancouver. Now, we know that many people won't be able to attend Dragoncon, but this doesn't mean that you can't be represented there in spirit. Please spread the word to your flists, boards, lists, and comms that we're collecting names for this. I haven't quite got these two characters down, as this is my first attempt at S/B fic. But I hope you at least get a little bit of enjoyment from it. Thanks to Meg for the beta and encouragement (as always).